Thanks for joining us at Summer Solstice 2018!! The Solar Foundation’s annual Summer Solstice event brings together our partners, allies, and friends to spend a beautiful summer night celebrating the power and promise of solar energy. On the evening of June 21, leaders in Washington, D.C. from across government, business, and nonprofit organizations gathered for an upscale cocktail hour and a rooftop reception. Purchase your tickets now and you'll get the lowest price available anywhere. Thanks for celebrating with us! Stay tuned for details about Summer Solstice 2019. 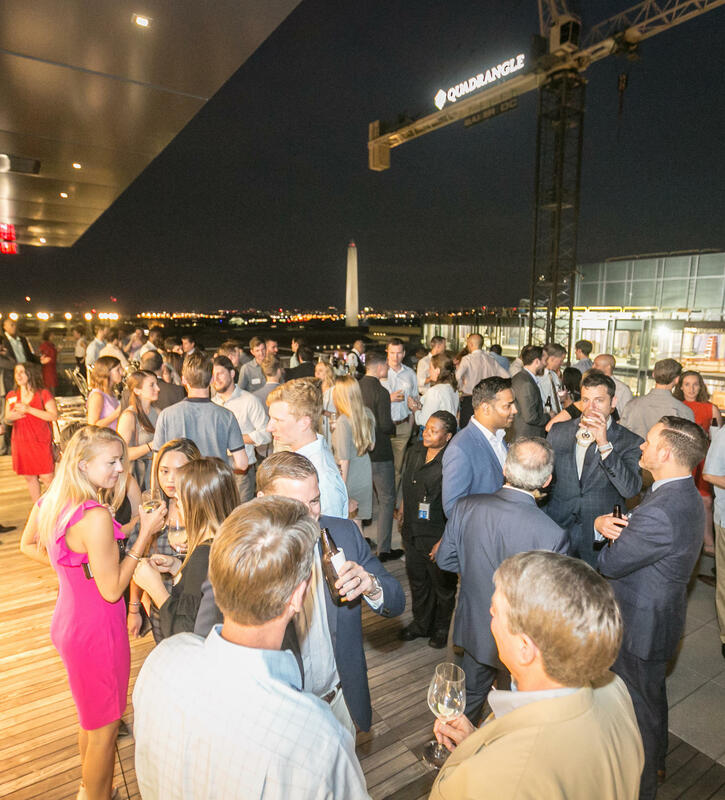 This year's Solstice guests were treated to a variety of hors d’oeuvres, complimentary drinks, twilight views of the D.C. skyline, and the opportunity to meet and network with leaders in solar, clean energy, and related fields. All tickets, sponsorships, and donations supported The Solar Foundation, whose work would not be possible without your generous contributions. Interested in sponsoring Summer Solstice 2019? Contact us now at info@solarfound.org. PRESIDENT, THE STELLA GROUP, LTD. The Hogan Lovells office is located in the Columbia Square building in downtown Washington, D.C. Entrance to building is on 13th Street Side. Once in the building, check in at the front desk and you will be escorted to the Hogan Lovells office on the 13th floor. DRIVE/WALK: The Hogan Lovells building address is 555 13th St NW, Washington, DC 20004. METRO: Closest Metro stop is Metro Center (Blue, Silver, Orange, and Red lines). Exit onto 12th St NW and walk to the corner of 13th Street and F Street. COAT CHECK: There will be a coat check located inside the Hogan Lovells office on the 13th floor. Your additional donation will support our work to accelerate the adoption of solar energy.